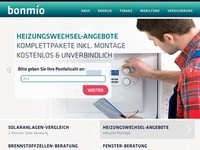 Bonmio is a comparison portal, which determines the user of the solar system provider for him or her. The user provides information on the solar system requirements. A lead is counted if the user specifies a valid address, telephone number and e-mail address.